Kaotika is my new Generative Sequencer based on using Random Number Generator, Static Generator, & WhiteNoise for creating compositions. 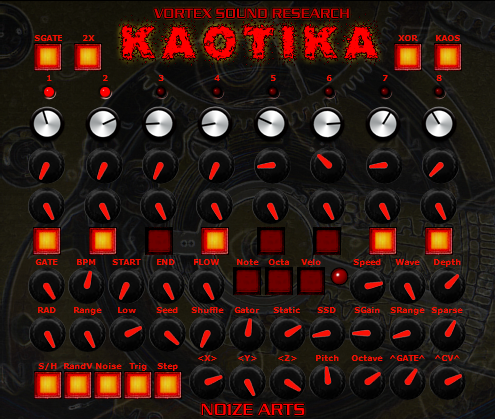 Kaotika is an evolution of KMF core adding 8 step sequencer engine hacked from my old projects. Kaotika is creative midi composition tool for driving hardware/software for producing Eerie, Macabre, Phantasmagoric, Horror/Scifi style soundtrack scores. Kaotika also is fully capable of producing EXTREME NOISE notations.